If youâ€™ve seen the Superman movies or read the comic books, youâ€™ll recall that Supermanâ€™s parents recorded the history of Krypton along with a lifetime of their own knowledge and possible answers for Superman on a small crystal that can last a lifetime and endure extreme temperatures. At the time, that seemed like the incredible musings of science fiction and just some far-fetched story arc to explain the unexplainable. Well maybe that crystal technology was not so far-fetched after all. Scientists at the University of Southampton, in the UK, have made an amazing discovery using nanostructured glass, they have developed the recording and retrieval processes of five dimensional (5D) digital data by femtosecond laser writing. As described in a press release disseminated by the University of Southampton, the process works by â€œâ€¦recording using ultrafast laser, producing extremely short and intense pulses of light. The file is written in three layers of nanostructured dots separated by five micrometres (one millionth of a metre). The self-assembled nanostructures change the way light travels through glass, modifying polarisation of light that can then be read by combination of optical microscope and a polariser, similar to that found in Polaroid sunglasses.â€ In simple terms, these scientists found a way to laser inscribe a tremendous amount of data onto a glass disc by distorting the laser light as it penetrates the glass â€œdiscâ€ to separate the light particles and allow it to see in a 5 dimensional manner. Of course this technology is in its infancy stage at this time, but just knowing itâ€™s possible to record essentially all of our recorded history and ensure that it will last through another possible ice age or thermal meltdown and survive until the next species inhabits the Earth and evolves into intelligent sentient beings that can discover these historical archives and have a full historical understanding of who we were and what we accomplished in our time on Earth. Thatâ€™s the stuff comic books are made of, but maybe comic books are not fairy tales but rather a challenge to reach our full potential. Contact Vinpower to schedule a face to face meeting at our booth # SL7406 during the 2016 NAB Trade Show. Once again, Vinpower will exhibit at the 2016 National Association of Broadcasters (NAB) trade show in Las Vegas, NV, which takes place April 18 â€“ 21, 2016. While attending the show, hereâ€™s your opportunity to visit Vinpowerâ€™s booth located in the South Hall, booth # SL7406 to see our latest line of duplicator hardware and media offerings as well as our exciting line of Apple mobile device accessories like the iConnect Mini. If you havenâ€™t already secured your entry pass for this yearâ€™s NAB, hereâ€™s another opportunity to reserve your entry pass to the show for free! But the offer is only good until April 1, 2016. That date is quickly approaching, so act now, or you may be forced to pay for the passes later. 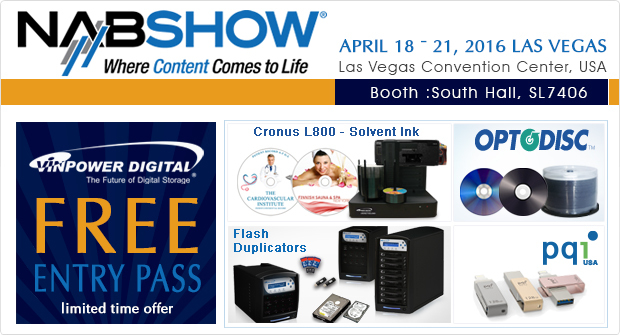 Simply click on the following link: www.NABShow.com/register, use the code: LV3467 and follow the directions for your free pass. When was the last time you thought about the incredible genius behind the invention of the light bulb, or even our ability to create and harness electricity for that matter? I would guess probably rarely if ever, because today we take these amazing leaps in technology for granted. Thatâ€™s also true for how complicated it truly is to accurately and consistently duplicate optical discs through an Optical Disc Drive (ODD). Iâ€™ve worked in this industry for nearly 12 years and I honestly never knew how many intricate parts had to work together with essentially little to no room for error just to burn a single disc, let alone hundreds, if not thousands of them. Vinpower is proud to partner with a number of high quality ODD manufactures to offer drives that are enhanced exclusively for the duplication market. For more details on any of the products that Vinpower carries, please visit our website at www.vinpowerdigital.com or speak with an official Vinpower representative near you. 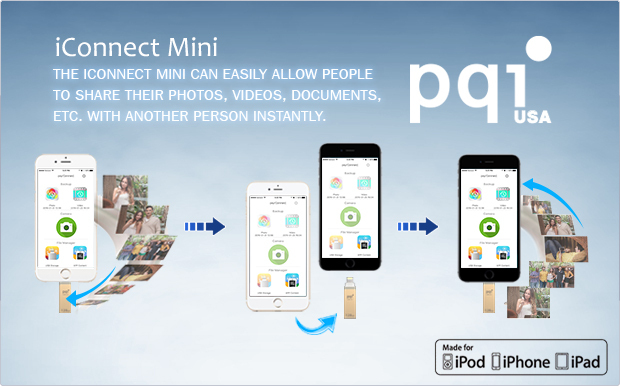 The iConnect Mini can easily allow people to share their photos, videos, documents, etc. with another person instantly. Picture this scenario. Youâ€™re at an event, maybe your childâ€™s school performance, a concert, sporting event, or on a holiday. Youâ€™re taking tons of pictures and videos with your iPhone or iPad. A close friend or family member whoâ€™s with you saw your pictures and videos and wished they could have a copy for themselves. Without the iConnect Mini, you would have to go through the hassle of downloading the pictures onto a computer, tethering your phone so itâ€™s unusable during the process, then going through your hundreds or even thousands of photos to find the few that you plan to pass along to that friend. Once you selected the pictures, then you have to transfer those photos onto a disc or a pen drive in order to give them to that friend. The friend may lose or forget to give back the pen drive, wasting your time and now you lost a perfectly good pen drive. The other option is to email each picture, 1 at a time due to size limitations, until youâ€™ve sent all the pictures they want, then your friend has to open all of the emails and download each picture individually back onto their phone or computer. Of course for videos, you can forget email because they are too large to send. Thereâ€™s a much simpler way, just connect the iConnect Mini into your iPhone or iPad, transfer the pictures & videos with one button onto the iConnect Mini, then connect that same iConnect Mini into your friends iPhone or iPad using the Lightning connection and easily transfer the exact pictures, videos, documents, etc. that you want to share with them directly onto their mobile device and viola, youâ€™re done. Instantly and hassle free, you are able to share images while still in the moment. If your friend doesnâ€™t have an iPhone or iPad, then you can use the USB3.0 connection and transfer those files directly to their computer. If there are any pictures or files you donâ€™t want anyone to have access to, you can easily use the Touch ID security to encrypt the files and prevent others from being able to see or access them from a mobile device or through the computer. The iConnect Mini is the perfect accessory for anyone with an iPhone, iPad, or iPod, especially those that like to take and share pictures and videos with friends, family and loved ones. For more details on the iConnect Mini or any of our line of mobile accessory products, please visit our website at www.pqiusa.com or speak with an official PQI USA or Vinpower Digital representative near you.